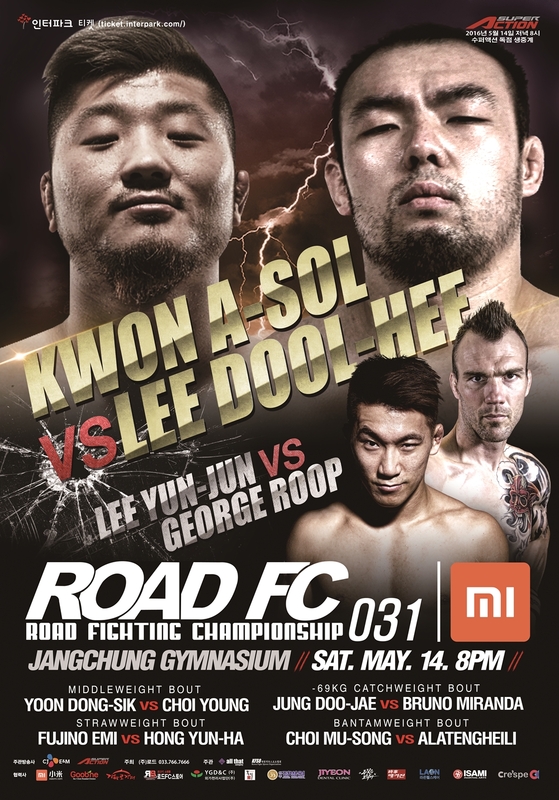 XIAOMI presents ROAD FC 031 headlined with the Openweight Match between Kwon A-Sol vs. Lee Dool-Hee. Also on the Main card of ROAD FC 031, ROAD FC Bantamweight Champion Lee Yun-Jun will take on newly-signed UFC veteran George Roop, the “Zombie Killer”. Legends collide as “Ryo” Choi Young makes his return to fight in Korea for the first time in ten years against Olympic-calibre Judoka Yoon Dong-Sik. Thrilling strikers Bruno Miranda and Jung Doo-Jae will begin their conquest into the featherweight division with a catchweight bout at 69kgs. In another exciting Women’s match, legendary Emi Fujino returns to face pro debutant Hong Yoon-Ha from ROAD FC Central League. Hot prospect Choi Mu-Song and China’s staunch MMA veteran Alatengheili look to deliver one of the most exciting bouts of the night.